An elegant addition to any wardrobe, the Amelia Brown Lace Skirt features a dramatic high-low cut ending near the knees in front and falling to the ankles in back. The long waterfall skirt is crafted from layers of brown lace. An elegant addition to any wardrobe, the Amelia Cream Lace Skirt features a dramatic high-low cut ending near the knees in front and falling to the ankles in back. The long waterfall skirt is crafted from layers of cream lace. A skirt is a great way of feeling feminine in your clothing, especially when that skirt features touches of lace. 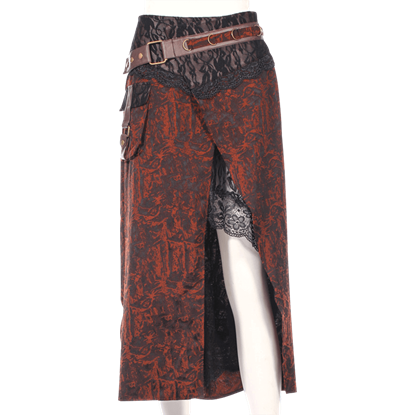 This Asymmetrical Lace Underlay Steampunk Skirt will complement your neo-Victorian style while showing a little skin. Perfect for creating an incredible steampunk ensemble, the Black and Brown Vex Skirt looks dramatic and playful. The steampunk skirt is a licensed design from Steampunk Couture and renowned steampunk model and fashion designer, Kato. 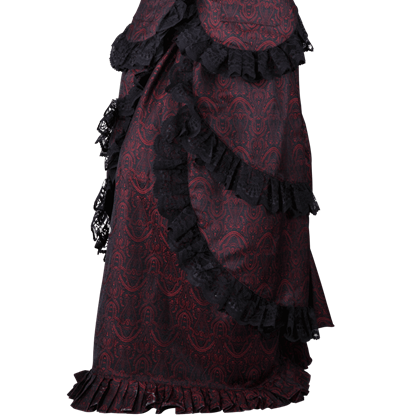 Whether you are wearing this striking skirt to a dinner party among the nobility or out and about a Steampunk city, you can rest assured that the Brocade Dinner Skirt will always help you to look your absolute very best. This stunning gothic skirt makes an elegant addition to your favorite ensembles with its unique design. The Brown Brocade High Waist Skirt has a waist that rises up under the bust and laces in the back for a more fitted look. Once you have the basics for a steampunk ensemble, accents like this Buckled Peplum Overskirt are great for switching up your style at a moments notice. Pair this overskirt with your favorite dress or skirt for a beautiful look. A classic accessory for vintage styles, this knee-length underskirt adds excellent volume to any ensemble. The Classic Layered Mesh Petticoat can be worn with many different looks ranging from Victorian to retro fifties to gothic. A classic accessory for vintage styles, this knee-length underskirt adds excellent volume to any ensemble. The Classic Layered Organza Petticoat can be worn with looks ranging from Victorian to retro fifties to gothic. An excellent way to add a bit of extra volume to your look, the Classic Mini Mesh Petticoat will provide plenty of flounce! This mesh underskirt will go well with many different styles, including steampunk and gothic fashions. An excellent way to add a bit of extra volume to your look, the Classic Mini Organza Petticoat will provide plenty of flounce! 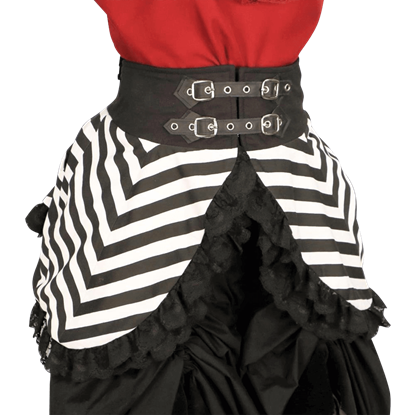 This ruffled underskirt will go well with many different styles, including steampunk and gothic fashions.